Do you ever lose things? I hate when that happens. The other day I was visiting a friend and her adult daughter was cleaning the carpets. She had filled the fresh water tank in the sink and then somehow lost the plastic screw top. When I arrived she had already pulled out the refrigerator and stove searching for the now very elusive cap. My friend suggested maybe the cat had spotted it and swatted it down the hall. The whole stay this poor girl spent looking for the lost. It’s frustrating. Everyone has been there. We have a large shade canopy that comes apart in a hundred pieces. One day the canopy was up on the lawn (but not staked) when a sudden gust of wind came. The canopy was blown into the air and landed fully on top our giant mesquite tree in the front yard. Amazingly, only one of the connectors broke. So we packed it up, kit and kaboodle and finally got around to ordering a replacement connector. The new piece arrived and floated around the kitchen along with the broken one. Until the day before we needed to put it up. Then it was no where to be found. Don’t you hate when that happens? We searched and searched. Voices were rising almost to the point of accusations, but no one quite willing to blame the other. Well, as it turned out the cat, in one of her fast paced escapes across the island must have knocked the connector into the trash. Our best “lost item” story came during a visit to my folks. The recliner chair was wiggling so the guys decided to fix it using the electric drill. No problem, tightened all the screws and the chair was good as new. But where was the drill chuck? It was there when they started, after all it’s needed to change out the bits. They searched and they searched. They went out to the shop and searched. They tore the chair back apart. They looked in their coat pockets–even the ones they weren’t wearing. It was well lost. And it didn’t show up. Time passed. Finally Grandpa broke down and bought a replacement chuck last year as he again needed to use his drill. This summer he walked along the front porch and there, to his great surprise, sitting in the flower pot was his chuck. The lost was found. Last week I found something very unique. A pair of glasses. Yes, several in this house wear glasses but I’ve not seen them before. 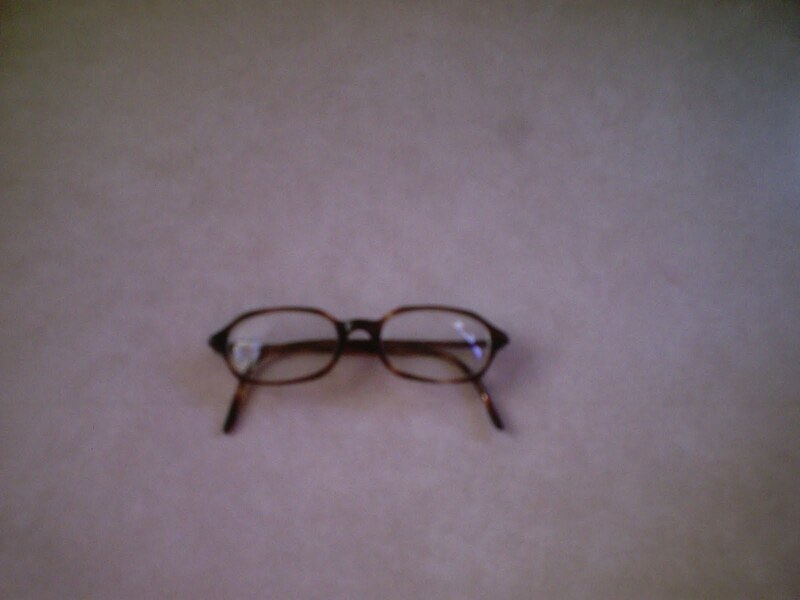 I tried them on–they are almost strong enough for my bad eyes so the person who lost them likely misses them. Can’t think of anyone to whom they might belong. If you recognize them, or if you need a pair and are myopic let me know and I’ll match up the found with the lost. It was a day for everyone to help. Grandma with her two new knees volunteered to stay on the ground level and be chief cook with Rebecca as her sous chef. 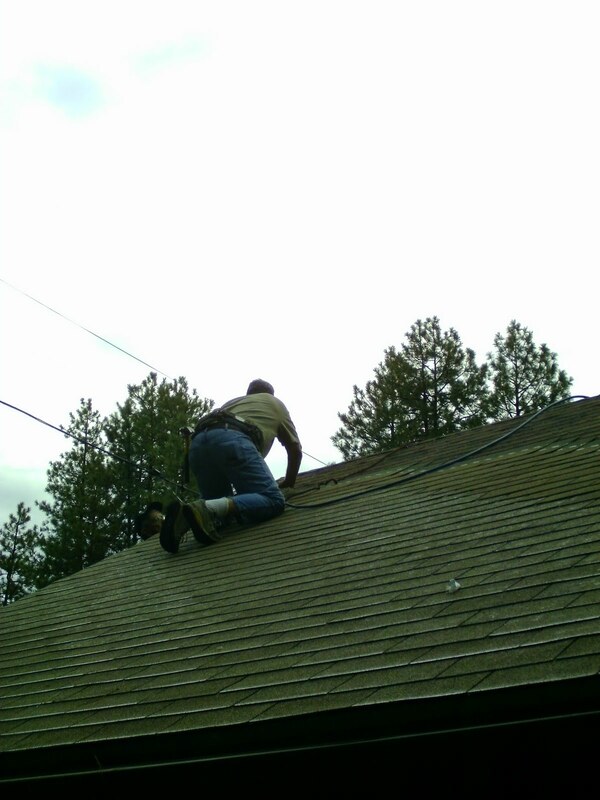 Matthew thought he was going to get out of working because there was no way he was climbing the ladder but someone had to carry the shingles from the front yard to the back. 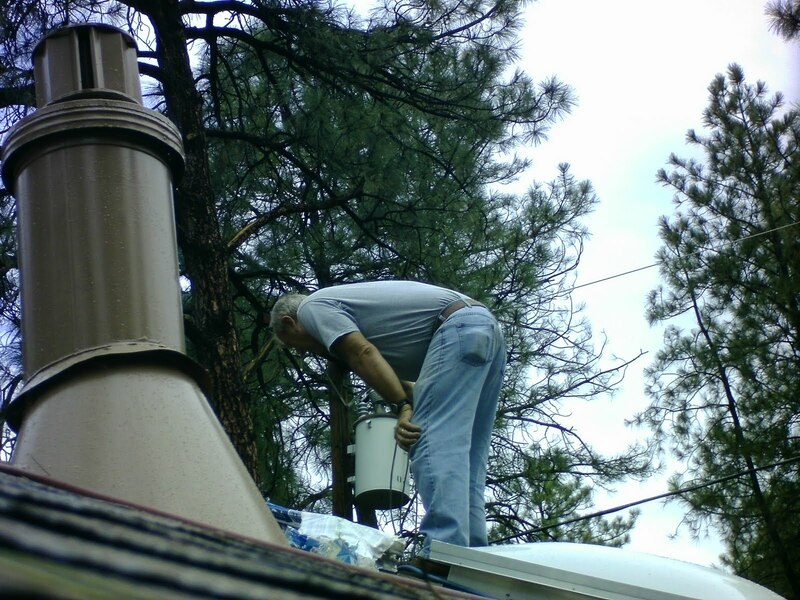 Grandpa was under strict instructions to not climb any higher than the porch roof so he worked as middle man. 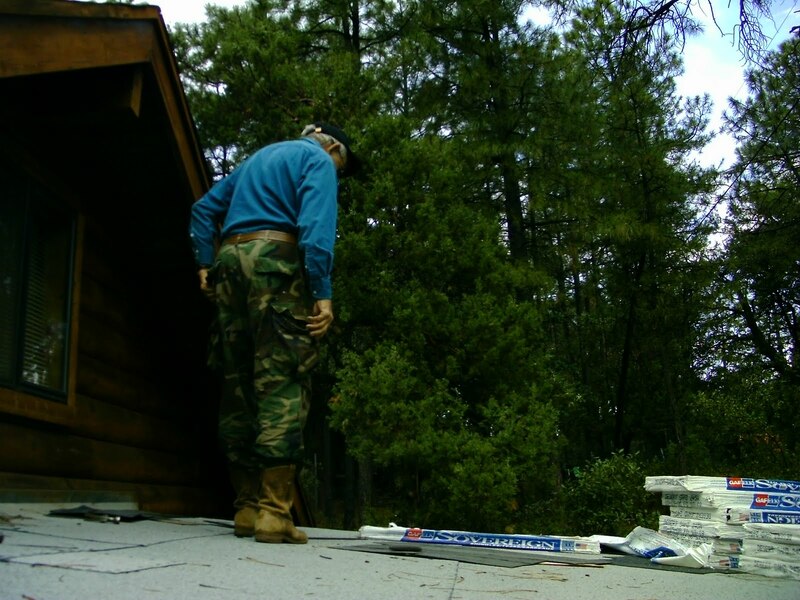 He was supposed to be supervisor only, but you try telling him that… I was brave enough to climb up on the roof and served as shingle mover. Of course we were outshone by brother Kelly’s teen boys who threw those bundles of shingles over their shoulders and climbed up and down the slippery roof as though walking across the sidewalk. It was truly wonderful to have these young, strong helpers. When I wrote my plaintive plea for help last month I was rewarded by a reply from a friend who offered, not only to come and help, but shared that he actually had experience. 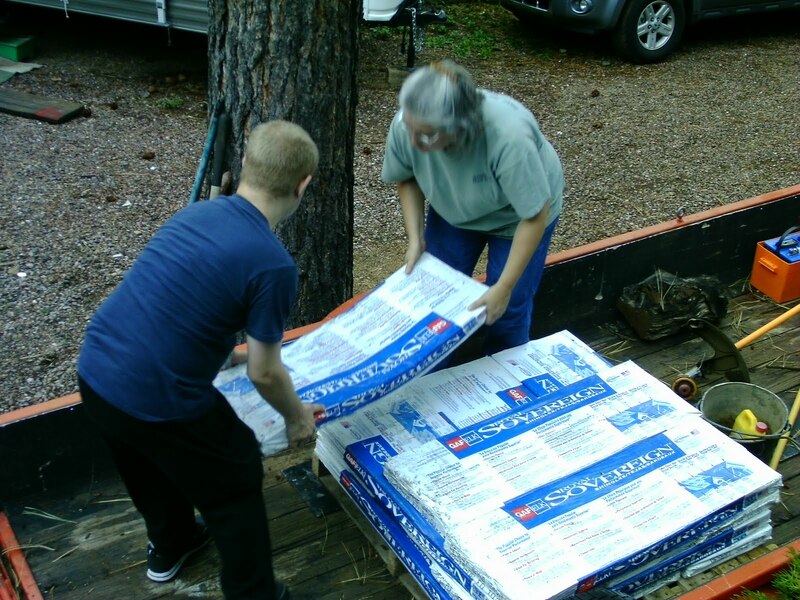 When Bob and Kelly ran into a challenge, like cutting around the fireplace or dormer, Rich was there to help. Rich also brought his wife Chris along and I promised she could spend the day reading or relaxing in the pines but she jumped in and helped the cooks along with watching Kelly’s young grandson. There was a strong threat of rain for the weekend so when dawn came and it was dry we all jumped up to get started. Kelly had mailed down not one but two nail guns so the work went twice as fast. The day was cool and perfect. Kelly and the boys had flown down from Anchorage so they especially were thankful for the lower temps. After lunch we clambered back up and made great progress until the rain started. Wow, do those shingles get slippery. It was great timing though as everyone was ready for a break. We were three-fourths done! Some of us (well, me in particular) thought that was more than good enough for the day but after the rain stopped the boys got their second wind and were back at it. It was absolutely amazing to finish this job in one day! It would have never happened without great help from family and friends! Health Care Reform? One of the Reasons . . .
Take a look at my apricot tree. We planted it shortly after moving in so it’s now over 20 years old. A few years ago we noticed several dead branches and the tree was leaking giant globs of sap. It didn’t look good. I visited our local nursery and talked to their arborist. He told me that apricot trees don’t live more than 10-15 years in our harsh desert and recommended not spending any money trying to fix the tree. “Take it out. Time to replace it,” he advised. Not being ones to give up so easily we trimmed out the dead wood, fed it some sulfur and stuff and said, “Let’s see how it does.” That was more than three years ago. There are many reasons I am opposed to the current Health Care Reform legislation. Outcome based health care is one. (You can look at House Bill 3200; Section 1162; subsection (ii) Establishment of Outcome Based Measures pages 335-339.) It is part of the payment section. In short, this subsection says that the government will mandate the establishment of “outcome based measures.” I can’t help but look at this and believe that this type of plan will move us from a health care doctor/patient relationship (with limitations by my chosen insurance plan) into a doctor/patient/advisor relationship. It appears that these mandates will add statisticians to the table. I don’t look at these advisor’s as a “death panel”, well, at least not in the sense that the patient will find himself standing in a circular room surrounded by black hooded robed “specialists” who can give life a thumbs up or down. But it does sound like the advisors will be able to overstep my doctor as to whether a test or procedure or even surgery would be covered based an individual’s health, age or the “predicted” prognosis. What will be the criteria used to make these decisions? Must one be a “productive member of society”–and how do we decide what that means? You might have read elsewhere about seniors who are concerned that they will be denied services because they have already outlived their statistical life. These concerns become particularly worrisome if funds become limited or the plan overpopulated–did you not ever watch Logan’s Run??? This change worries me greatly and here’s my real life example. Our son, Matthew, was diagnosed years ago as having Cerebral Palsy. He also fits the criteria for Autism. Perhaps now that Matthew is 26 I could make an argument that he doesn’t really have CP or that it is such a mild case that the statistics of mortality wouldn’t fit him. You’d probably agree watching Matthew as he appears quite healthy. But I’ve been told for years, “Once Diagnosed; Always Diagnosed.” In other words once you have been diagnosed by an “expert” you have this disease until you can find another “expert” to retract it. Okay, let’s take CP out of the picture and just look at Autism. You’ll see many places where it state that people with Autism are expected to have normal lifespan. Yet there are studies (lifeexpectancy.com) that show autistic people have a reduced life expectancy. What if Matthew gets cancer? Would he be treated as aggressively if someone gives him a higher mortality rate? Would he be denied therapy because he’s not a productive member of society? And who gets to make those decisions? The other day I read about a young girl born with Down’s Syndrome in the UK. Like a whole lot of “normal” infants she had some complications. Unfortunately, during treatment she was given too much antibiotics and down the road her kidneys were in failure. At that point she was a good candidate for a transplant as she was in otherwise good health. But the advisors with the National Health Service in England said that she was not eligible because she would not be able to care for herself and take the medications as needed. It is a tragic story that I have trouble even retelling it because I can’t help but think of children I know with Down’s or other special needs. Looking at the proposed health care reform plans it’s obvious we must be a voice for those, like Matthew, who can’t talk. 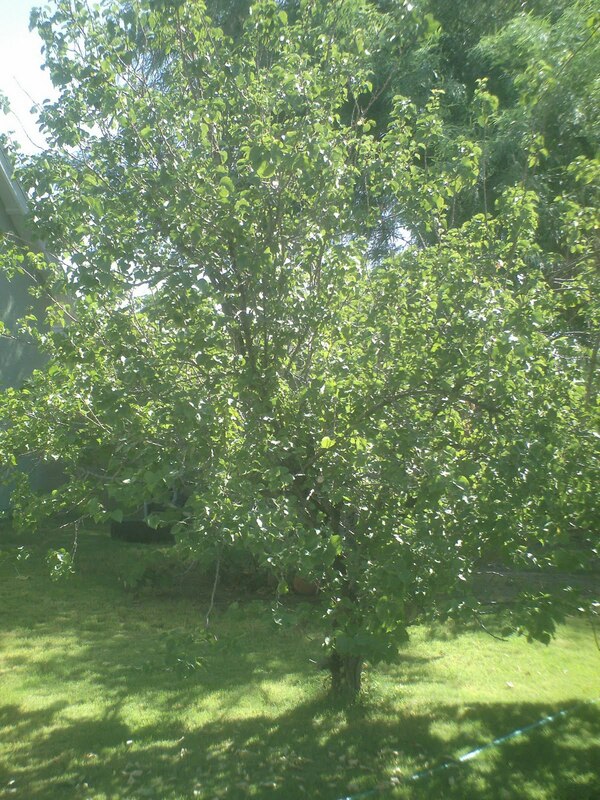 If his doctor, my husband and I agree on a treatment plan for any given ailment we do not want a government bureaucrat to come in with a “thumbs up” or “thumbs down.” Like my apricot tree’s continue growth, statistics don’t always hold out. It’s something to think about as we sit under its shade and watch the birds in their nest. It was a typical Arizona morning. The sun was just coming up in a cloudless sky. The radio popped on just in time to hear the announcer say a plane had crashed into one of the Twin Towers in NYC. About the same time Mom, who was then staying with us, called upstairs to find out if we had heard the news. We quickly turned on the television and saw the camera focused on the crash. Looking we realized from the giant hole that it must be commercial flight, not a small plane, and we wondered how a plane could crash into such a building on such a clear day. As we were watching another large airliner came in to view, flying low over the city. It seemed out of place but we didn’t realize until it hit the second tower what was happening. Oh My God. . . our hearts stopped. Did the clock? It seemed that time paused those initial moments as we watched our country attacked. We all stared, unbelieving, at the television. How could this happen? Who could do this to us? No one moved from the TV. Everything was forgotten as we shared the horror with our countrymen. How many innocent people were on the airplanes? How many in the buildings? And then. . . could it be worse? News of the plane crashing into the Pentagon. News started coming in about another plane down. Most of the footage centered on the towers as access to the capitol was closed. We watched, gasping, as people, trapped on floors above the carnage, jumped to certain death. And. . . then, it was worse as both towers collapsed entombing thousands forever. The terror we felt can in no way be measured against those living in New York and DC or of the families who lost their loved ones. We were bystanders. Yet, we were united together as we cried, our hearts aching for those lost on that fateful day. Got all kinds of things to write about but first things first. Matthew was looking for something to eat today when he spotted the Kinnikinnick pizza crusts in the freezer. I didn’t have all the ingredients for a pizza, nor did I want to heat the oven so I offered to cook one up with cheese. 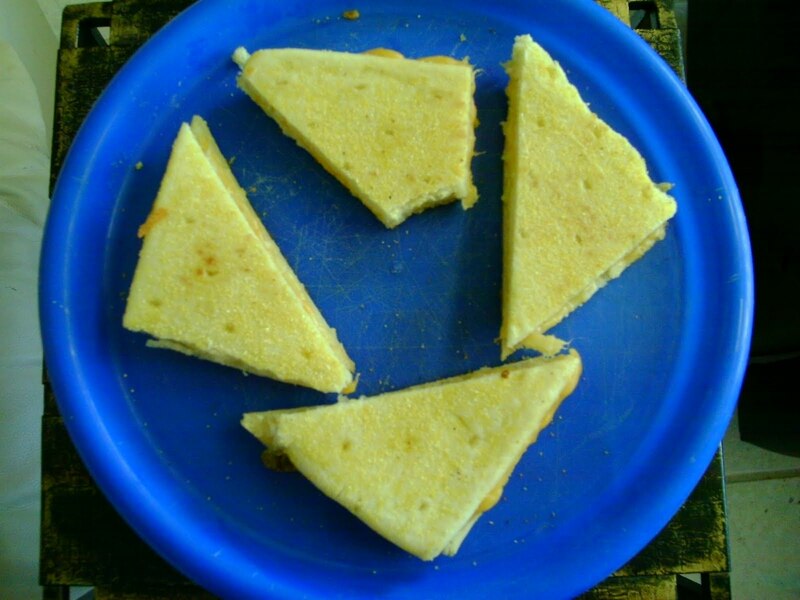 We cut the 7in square crust in half and placed one half in a pan. Then I piled a liberal amount of shredded cheese and stacked the other half on top. Just like I would a regular grilled cheese except that this “pizza crust” comes with a bit of corn meal on the bottom so I didn’t butter it. I pressed the sandwich down by setting a cast iron skillet on top. We cooked it over medium heat and when the cheese just started melting turned it over. The skillet sitting on top seemed to help the sandwich cook evenly. When the cheese was melted and just starting to bubble out we took it out of the pan. I was surprised that this crust would turn out so moist and made a great sandwich. Best of all, there was no crust. When I picked up these individual size pizza crusts I had planned only on making pizzas. Now, I see there are many more possibilities. Kinnikinnick products are available at our local Sprouts and Whole Foods stores in Arizona and you can order them online. To answer your first question: What is a tea party? Of course, you remember your history lessons about the Boston Tea Party which was a protest about taxation without representation. Last year as the country voted in an administration that promised change many were still surprised at how expensive “change” would be. Bank and auto bailouts, a huge stimulus plan followed by an even bigger budget got people’s attention. 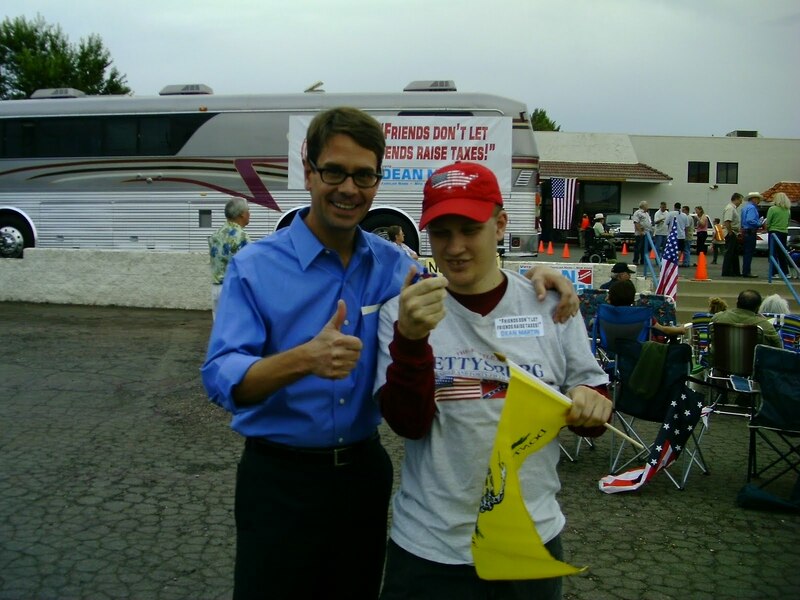 Thank the internet for the speed of the modern day tea party grassroots formation. Bloggers and, yes, tweeters found like minded people who were concerned about the huge increase of federal spen ding in such a short time and in such a weak economy. In the spring, leading up to tax day the Tea Parties grew becoming a voice for people upset with what they saw as fiscal irresponsibility. The “anti-tax day” tea parties have expanded to cover other areas where citizens are concerned including Second Amendment Rights, Health Care Reform, States’ Rights and the like. You might remember I attended a town hall meeting last week. We were looking for the “Angry Mob” and the “Organized Protesters” that we had heard about from some of the Democratic leadership. And if you watched John McCain’s town hall…well…you saw Matthew and me… Hardly fitting of a mob and especially not v ery organized. So when my mom told me about the Tea Party Express traveling from Sacramento to DC I thought this might be my chance to see some of these radicals. We decided to make the drive to Flagstaff. Now this time you might say we were organized, as we planned enough to pick up my mom on the way. But we weren’t organized enough to think about taking long sleeved shirts for the cool Flagstaff evening. (Lucky they have stores there…) And we certainly weren’t angry (Matthew is never mad when his portable DVD player is working.) Anyway, the event was scheduled to start at 6pm but we thought we should be there early and good thing because the crowd was already gathering when we drove in shortly after 4. As you might guess Fox news was there following the Tea Party Express, but also “embedded” on the bus and reporting in were reporters from the likes of CNN and NPR. I know you’re thinking, “Okay, out with it. Did you see any angry mobs? Did they appear to be professionally organized?” And the answer is pretty simple. I saw lots of ordinary people dressed like me. Some wearing jeans, some wearing Docker’s and one guy in a Daniel Boone outfit right down to his boots. 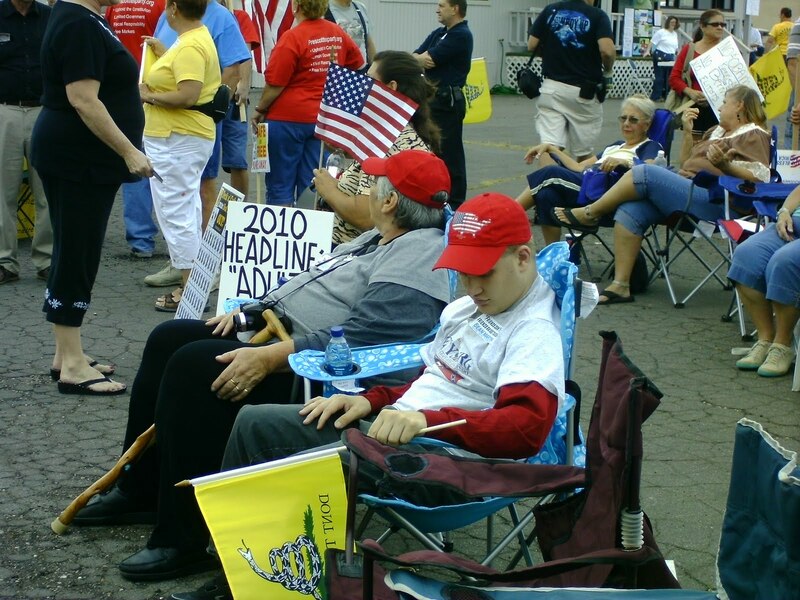 I saw several pro Second Amendment people–it was easy to spot the ones with their revolvers strapped to their waist–no surprise as there are a lot of Libertarians in the state. I did not see anyone with an AK-47 or any other big gun for that matter. People carried homemade signs, some pretty funny. Generally there were a lot of flags and red, white and blue. 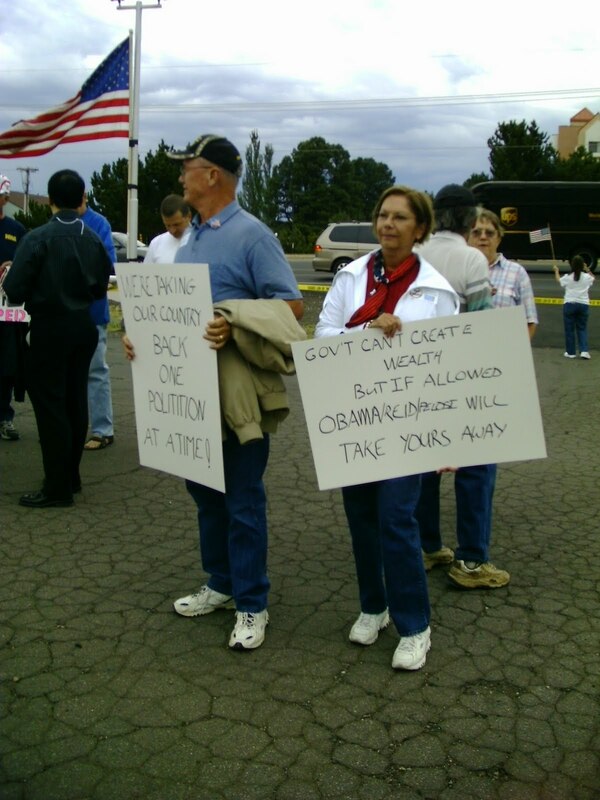 When the Tea Party Busses arrived the crowd grew. I’m guessing a couple thousand were there. It seemed like a lot. The event was much more than I expected. There were some great singers, some short speeches, assorted politicians and lots of cheering. Kind of like a pep rally. We waved our flag and clapped when they talked about the Constitution and how great the United States of America is. They wrapped up with a tribute to the soldiers and invited all the active duty and veterans to come up front. I was amazed at how long the line was. There was even a soldier from WWII there. Of course everyone teared up when a mom of a fallen Marine was introduced. Freedom isn’t free. 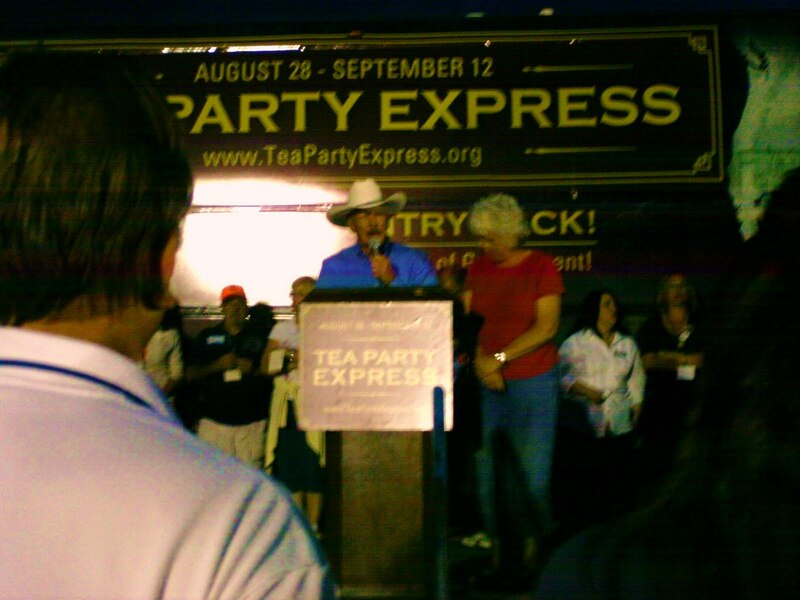 The Tea Party Express is travelling across the country for the next two weeks. If you have the opportunity I highly recommend you go. We need to stand up for America. We are still the greatest country in the world. 4. Recently retired Sheriff Joe Richards (Dem) from Coconino County. Plain spoken man, obviously loved by all.